Hartford - State Senator Art Linares (R-33) and Representative Christie Carpino (R-32) welcomed the 2018 Connecticut Kid Governor and her family to the State Capitol for the first day of the 2018 legislative session. Connecticut Kid Governor Megan Kasperowski, a fifth grader at Brownstone Intermediate School in Portland, was joined by her mother, Lauren Kasperowski, and her grandmother, Mary Lombardo. 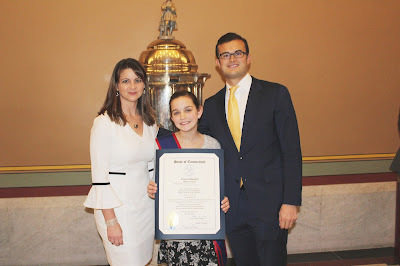 Sen. Linares and Rep. Carpino presented Megan with a citation from the Connecticut General Assembly congratulating her on her achievement. Megan was elected Connecticut Kid Governor by fifth graders from across the state. Her platform is Stronger Than Cancer: Lifting Spirits and Changing Lives. She will serve a one-year term participating in programs by the Public Affairs Network to raise awareness about people fighting cancer and raise money for cancer programs. People can learn more about Connecticut’s Kid Governor – both the program and the student – at CT.KidGovernor.org or by following CTKG on Facebook, Twitter and Instagram. Sen. Linares represents the communities of Chester, Clinton, Colchester, Deep River, East Haddam, East Hampton, Essex, Haddam, Lyme, Old Saybrook, Portland and Westbrook. Rep. Carpino serves the communities of Cromwell and Portland.